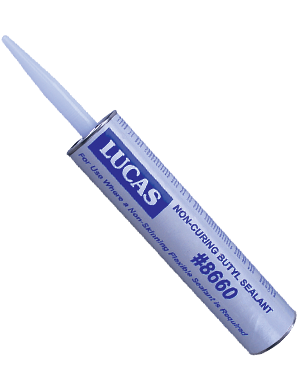 Lucas #8660 Non-Skinning Butyl Sealant is a low modulus, butyl rubber based, non-sag sealant. It is intended for use as a sealant for metal roof and panels. It has permanent flexibility, high moisture resistance and an exceptional ability to absorb sound and movement. #8660 is also useful anywhere a low modulus sealant is desired such as in OEM trailer and RV applications, acoustical ceiling and wall installations and walk in cooler and freezer applications. Not for use as a single-ply roofing adhesive or lap adhesive.